Let me start with my christmas eve present ok? It was a oswald the lucky rabbit doll! !that was my fav so merry christmas HAPPY HOLIDAYS!!!!!!!!!!!!! Every day i'll tell you guys out there who read this what i've been doing for the last 5 days of summer !!!!!!!!!!!!! yes you've guess'd it (thanks to the title :() i am once again a mario fobic or buff btw they made a mario tv show my mom wants to show me these mario folders!!!! 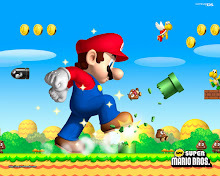 I LOVE playing Super Mario Bros. I LOVE movies... especially Tim Burton movies!